Kim Hye Jin (Hwang Jung Eum) was a very pretty girl from a rich family. After her family's publishing company went bankrupt, she experienced hardships then lost her beauty too. Ji Sung Joon (Park Seo Joon) was an unattractive boy with low self-esteem, but grows up as a handsome and successful editor. The two decided to meet again as adults, but Sung Joon was unable to recognize Hye Jin. Ashamed to meet her first love and ruin his perception of her, Hye Jin asks her attractive best friend, Ha Ri (Go Joon Hee), to appear in her place. Things, however, soon get complicated as Hye Jin was assigned to work at The Most magazine publishing office where Sung Joon is the deputy chief editor. He openly mistreats and belittles her for her clumsy nature, not knowing that she was his real childhood friend. I did enjoy She Was Pretty a lot but when it came down to the story I have to admit that I was a little disappointed. The drama was so full with so many side characters and problems that were not used enough. A lot of them could be used as factors to explain some situations and filled up the time that were used on scenes that had no meaning AT ALL. I’ll give u an example. When they brought in Hye Jin’s younger sister, I thought she would have more factors in the story but was just another unused side character. 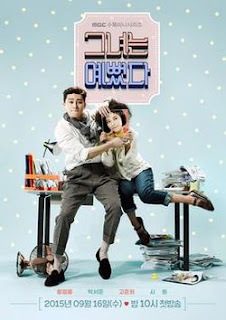 Moving to something else; What I’m going to remember the most about this show is Kim Shin Hyuk (Choi Si Won). Never before have I had such a ridiculous second lead syndrome. Hwang Jung Eum and Park Seo Joon, had funny, warm, enjoyable characters too, separately! Together, they got NOTHING. I really couldn’t watch them with the romance stuff. Bad bad bad chemistry. The plot got so cheeeeeesy, it was hard to watch. Anyway, I don’t want to say it was a bad drama or anything, after all it had it’s good times too. I just don’t understand why it got so popular… But that’s my mystery. Despite its many faults it was an enjoyable drama.